Controlling the expansion of kudzu has become an important environmental issue in the Southeastern United States. Originally “kuzu” in Japanese, it was taken from China and introduced to the United States in 1876 as a method for controlling soil erosion, and has since become an aggressively invasive species. The term kudzu is a popular term used to describe a group of closely related species under the genus Pueraria that are very similar morphologically, namely Pueraria montana, P. lobata, P. edulis, P. phaseoloides and P. thomsoni . 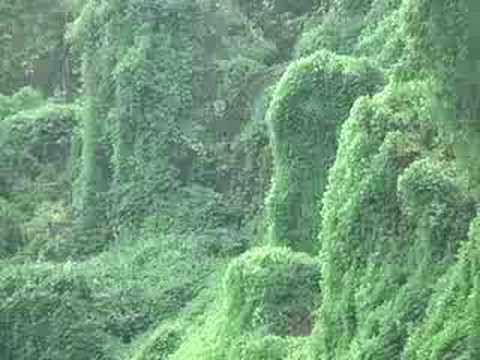 Kudzu in the United States can be classified as invasive because it is a non-indigenous plant that thrives in a foreign ecosystem as a result of distinct advantages over native plants, and through its expansion negatively affects the native ecosystem. A leafy vine that grows very rapidly, it tends to grow on and over native plants, competing with them for sunlight and smothering them. It is usually found dominating large swaths of ground and canopy with very few other species growing alongside it. Many expansive areas in the Southeast have been effected, most of which are in Alabama, Georgia, and Mississippi, and it has become such a large problem that kudzu has earned a place on the United States Government’s Noxious Weed list. A large portion of the success of Pueraria montana can be attributed to its morphology. Plants that fall under the category of a “vine” tend to spend more energy developing stems, branches, and leaves than developing a support structure, and so must rely on the support of other plants to reach well-lit areas. Kudzu specifically allocates a high percentage of its energy to the elongation of stems and offshoots, allowing for up to 19cm of growth in a single day. A high growth rate allows it to reach the tops of the large pine and deciduous trees it relies on in a relatively short amount of time, thereby gaining access to sunlight ahead of other plants. Also, kudzu plants have a large leaf surface area compared to other plants in the biomes it invades. The ratio of leaf surface area to stem biomass in Pueraria montana is over fifty times larger than the ratio in deciduous trees. This not only means that it can gather more energy for rapid growth, but that it also blocks more sunlight from reaching competing plants below it. The ability of kudzu to quickly reach an area of sunlight and then completely dominate it with leaf coverage is the core of its aggressively invasive nature. Another major reason kudzu has thrived in the Southeast is because it lacks natural predators in invaded regions, unlike the native species it competes against. In its original regions in China, Pueraria montana suffers damage from infestations by many species of insects, while in the United States very little damage is seen. In China all parts of the kudzu plant, the stems, the leaves, the roots, the seeds, are specifically attacked by various species of insect. In some regions damage can be debilitating, and prove a substantial barrier to expansion. In the United States, however, only the seeds and the leaves suffer routine damage by predators, and damage done to the leaves is caused only by generalist herbivores that do not specifically prey on kudzu. One study has shown that invasive species suffer less herbivore damage due to their phylogenic distance from native species. This is likely for Pueraria montana, since its only specific predators that have been documented in the United States are also of Asian origin. Therefore, kudzu has a distinct advantage as a non-native plant in that it has fewer barriers to expansion and has to allocate fewer resources to the reparation of damage.